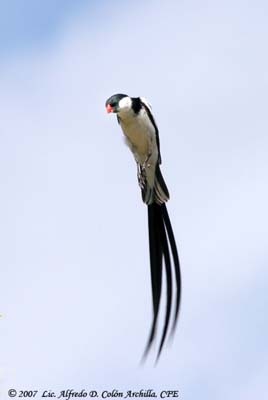 Pin-tailed Whydah is a parasite for other birds’ species such as Family Estrildidae. 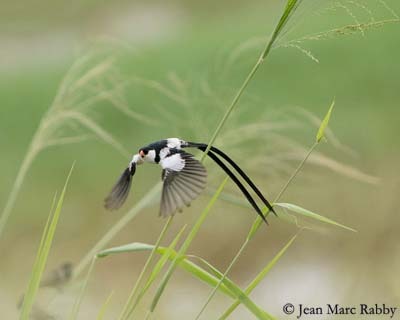 Pin-tailed Whydah is very common and this species is not threatened at this moment. 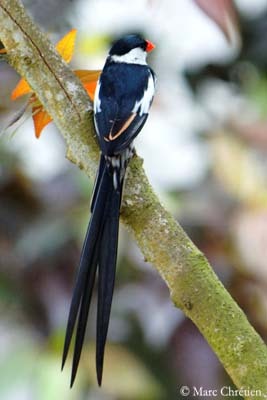 Adult male in breeding plumage has black and white body and conspicuous long black tail. It has black crown and face, back, flight feathers and tail. 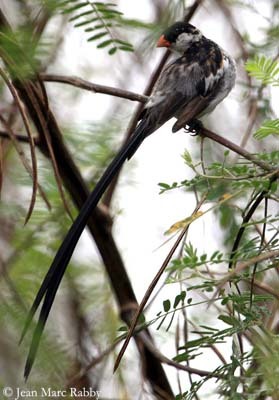 The long tail shows four elongated central rectrices of about 20-22 cm. Upperwing shows pure white wing patch on scapulars. Rest of plumage, rump, nape, neck, chin, throat and underparts are pure white. The conical bill is bright red. Eyes are brown. Legs and feet are blackish-grey. Male in non-breeding plumage is similar to female with broader contrasted markings and slightly larger body. Change of plumage in male, especially on the back. Female is very different. She has short tail and brownish plumage. Upperparts are black and brown with streaked pattern. Wings and tail are dark brown with buff and white edges. Underparts are white with buffy-white body sides and some brown streaks on flanks. Head shows conspicuous striped pattern black and buff. Bill is pinkish. Juvenile is grey-brown above and buff below. It has dark greyish bill. 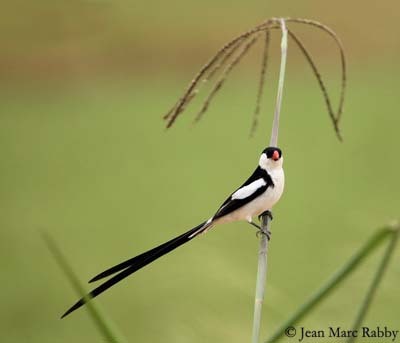 Pin-tailed Whydah utters high-pitched, short squeaky notes “tsip, tsit, tsit, see, see, churr, chrrt…”. 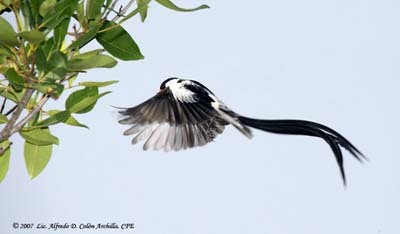 In flight, it utters “tsip tseep” or sharp “chip chip chip” while fluttering in the air with vertical tail. 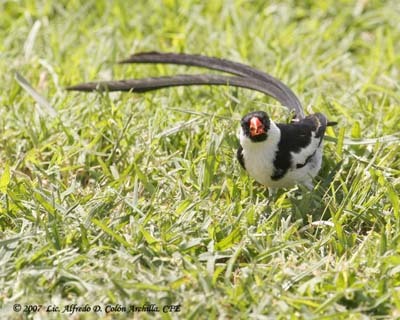 Pin-tailed Whydah frequents gardens and parks, savannah, grassland, scrub, bushveld and farmland. 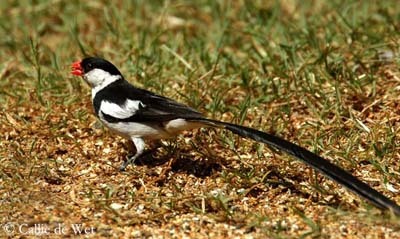 Pin-tailed Whydah is found throughout Sub-Saharan Africa. This species has been introduced in Hawaii, but without great success. However, the species is present in Puerto Rico. 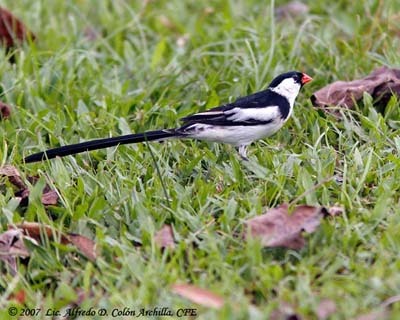 Pin-tailed Whydah feeds mainly on seeds and insects. They forage is small groups with one long-tailed male and several females, and non-breeding youngs. This bird forages on the ground by moving jerkily backwards on tarsi, and pecking quickly at disturbed ground. It often drinks at roadside pools. The male is often perched on telephone wires and fences. More conspicuous than female, it is more visible and often observed. The male may be very aggressive and chase other birds while it is displaying. 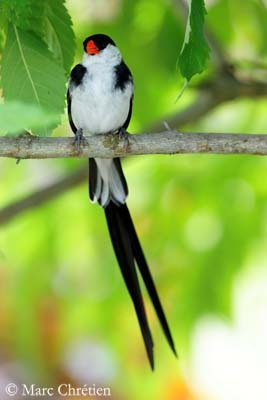 The male performs superb courtship displays during which the spectacular long tail plays an important role. It performs an aerial mating dance with hovering flight above the female during which the tail is flicked up and down while it sings continuously. It performs circular flights while dancing and vibrating. Displays occur low over the ground. The male may sing during several weeks from exposed perch, but this song is a buzzy sound becoming fairly irritating at the end. 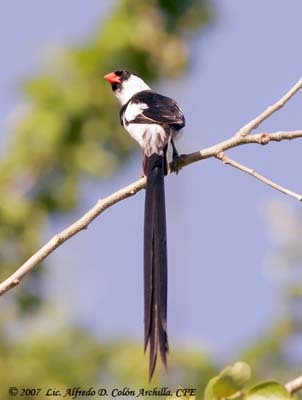 Pin-tailed Whydah is a parasitic species which lays in nests of other birds such as Estrildidae, frequently in Waxbill’s nests. Male is territorial and often has several females within a small group. 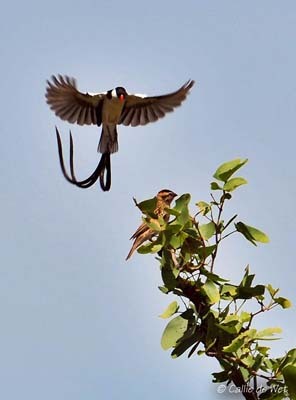 Pin-tailed Whydah performs spectacular flight displays. Outside the breeding season, this bird has erratic bounding flight. 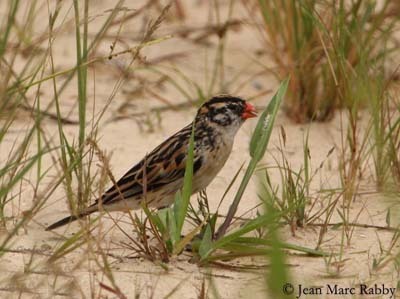 Pin-tailed Whydah breeds in the summer months, at the same period as the parasitized species. This species does not build nest. The female lays her white or creamy-white eggs in the host’s nest, within the same period as the host lays its eggs. All the chicks are raised together. 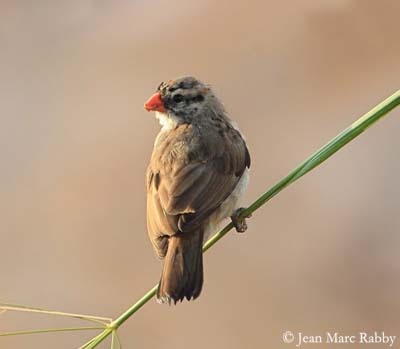 The Pin-tailed Whydah chicks often are more aggressive than the Waxbills. The eggs of the host are not destroyed. 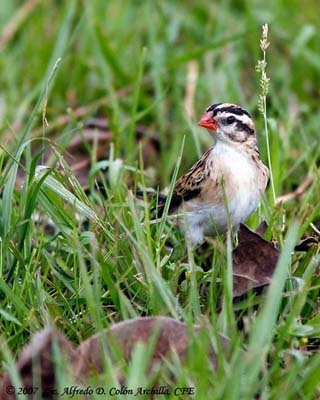 The female Pin-tailed Whydah only adds hers to the nest. The whydah chicks are able to mimic those of the host, with wide open bill. 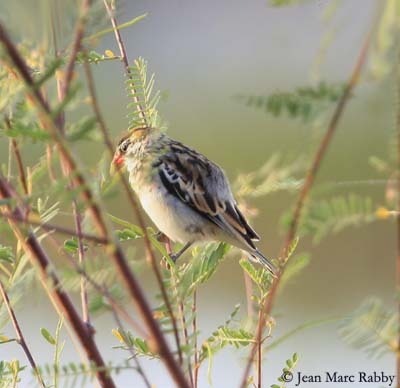 They often are very similar, with same gape, throat and commissure patterns, but the whydah chicks are larger and beg louder than the waxbill chicks, often involving their death. Pin-tailed Whydah feeds mainly on seeds taken on the ground. This species also consumes insects caught on the wing.